"The successive governments of Sri Lanka have taken many progressive initiatives to develop Information and Communication Technology (ICT) sector in Sri Lanka. For all citizens, ICT has been found to be beneficial as ICT can provide solutions to the various needs of the citizens. For citizens to get the maximum benefits from these projects they need to be computer literate. Certain groups are far less likely than others to have computers or online access. Lack of such access affects the ability of children to improve their learning with educational software, adults to acquire valuable technology skills, and families to benefit from them. This phenomenon is called digital divide. There is growing concern about the implications of ‘digital divide’, whereby some social groups lack the means to access new Information and Communication Technologies, while others reap labour market rewards for being on the cutting edge of these technologies. To plan and implement strategies to minimize this gap, a comprehensive examination of computer use in work places, homes and community settings is required. The extent to which students have access to computers at school and at home may be an indicator of how well prepared students will be to enter into technological workplaces which demands computer literacy. 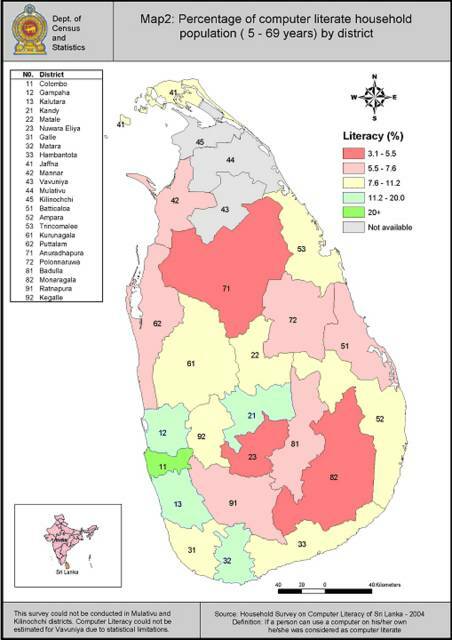 The Department of Census and Statistics conducted a pilot study to assess the computer literacy of household population in the group of 5 – 69 years of Sri Lanka as well as to find out to what extent they use computers for various activities including use of e-mail and internet facilities. Availability of home computers, e-mail and internet facilities etc in the households were also assessed by this study. This study was conducted as a household survey. 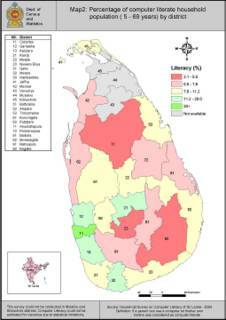 Household members in the age group of 5 – 69 years of scientifically selected 11,500 households covering all districts other than Mulativu and Kilinochchi were interviewed. Sri Lanka is still not a fully-fledged computer user. Therefore, it is not possible to adopt definitions on computer literacy used by developed countries. In defining computer literacy for this survey, some sort of level of comfort around computers rather than a look of fear and a feeling of foreboding was used. For this survey a person was considered as computer literate if he/she could do something on his/her own using a computer. For example, if a child of 5 years old could play a game using a computer on his/her own, he/she was considered as computer literate. Some key findings of this study are described below. Estimation of computer literacy of the household population in the age group of 5 to 69 years of Sri Lanka was the main objective of this study. At national level, 10 percent of the above population is computer literate. Western Province reported the highest computer literacy rate of 15.3 percent and the lowest percentage of 5 percent was reported from Uva and North Central provinces. "